Want an Inside Look at SLC’s Waste Management System? Master Recycler 2017 is Now Enrolling! Are you interested in the nitty gritty of recycling? In learning why plastic bags are so hard to deal with? Or what happens when garbage gets sent to the landfill? Would you like to become a greater champion for reducing, reusing, and recycling in our community? The program has been providing in-depth education about recycling, composting, and solid waste management to Salt Lake community members since 2015. It gives participants a behind-the-scenes look at Salt Lake City’s waste management system from bin to recycling plant. By learning from outreach experts and visiting waste management facilities, Master Recyclers are empowered to educate their own communities about all aspects of waste reduction. Everyone is welcome to participate! Registration is open until the class is full. The Sustainability Department is Hiring! Are you passionate about recycling and helping Salt Lake City divert as much waste from the landfill as possible? Do you have management experience? The Salt Lake City Sustainability Department is hiring a Program Director to head up our Waste & Recycling Division (formerly known as the Sanitation Division). This position reports directly to the Sustainability Department Director, Vicki Bennett. Do you live in an apartment in Salt Lake City that does not offer recycling? We’re currently in an education-phase of bringing recycling to more properties and residents in Salt Lake City, based on a new business and multi-family recycling ordinance passed in December 2015 by the Salt Lake City Council. Can you help us spread the word? They can also attend an upcoming workshop on November 10 to learn more! There is no such thing as away when it comes to waste. It is out of sight out of mind, but it is never truly gone. When things are thrown away, they go to a landfill to pile up in a heap. Some of the items will eventually break down, while many others will not. The reality of the trash heap can be summed up in a word: hopelessness. It is the end of the road, and the possibilities of re-creation and re-purposing are gone. However, recycling brings back possibility. As the newest intern at SLC Green, my first official order of business was to tour some of the recycling facilities for Salt Lake City. This tour was a front row seat to possibility. One of the stops for the SLCgreen crew was Momentum Recycling. Momentum was founded in 2008, and in 2012 became the exclusive glass recycler for Salt Lake City. In 2012, Momentum was bringing in about 200 tons of recycled glass. In the past four years, since expanding their curbside services, they now bring in approximately 1,000 tons per month! I will be honest, it was overwhelming to see how many glass bottles were waiting to be sorted and recycled, but the beauty of possibilities also struck me. Instead of hopelessly ending in a landfill, these items could become something new and useful. March is Sustainable Living Solutions and Inspiration month at the Winter Market. Meet with Utah business owners and organizations who inspire environmentally friendly living solutions. A handful of local agencies, including SLCgreen, will be in attendance at the Winter Market on March 12 and March 26 from 10:00 am to 2:00 pm to discuss what services are available to you and how you can reduce your ecological footprint. Did you know that electronic waste (e-waste) is the fastest growing waste stream in the United States? Valuable precious metals can be salvaged from recycling e-waste and toxic chemicals are prevented from entering the landfill and ground water. Good news — Recycle Solutions will be onsite at the March Winter Markets collecting electronic waste from 10:00 am to 2:00 pm! Below is a list of acceptable goods. Please note CTR TVs (tube TVs) or refrigerators will NOT be accepted at this collection event. For more information visit the SLC Downtown Farmers Market website or Facebook page. Salt Lake City Green is excited to announce the spring 2016 Salt Lake City Master Recycler program! Register at SLCMasterRecycler.com. Salt Lake City Green is working to build out a network of residents who are trained and certified Master Recyclers who understand all aspects of waste reduction, city services and bin downsizing options. Master Recyclers commit to attending eight weekly workshops running from May-June 2016. Classes are scheduled for Tuesdays from 3-6 p.m. A full class schedule is below. Workshops will cover a variety of topics and emphasize opportunities for hands-on learning. Every workshop includes a field trip for a behind-the-scenes look at the Salt Lake County Landfill, Salt Lake City Sanitation, Rocky Mountain Recycling, landfill composting operation and Momentum Glass Recycling. You’ll even “tag” along with Salt Lake City’s can inspection team! A tote bag full of Master Recycler swag, including t-shirt and stainless steel water bottle. The knowledge to help your friends, neighbors and kids maximize your recycling & reduce your impact on the environment. 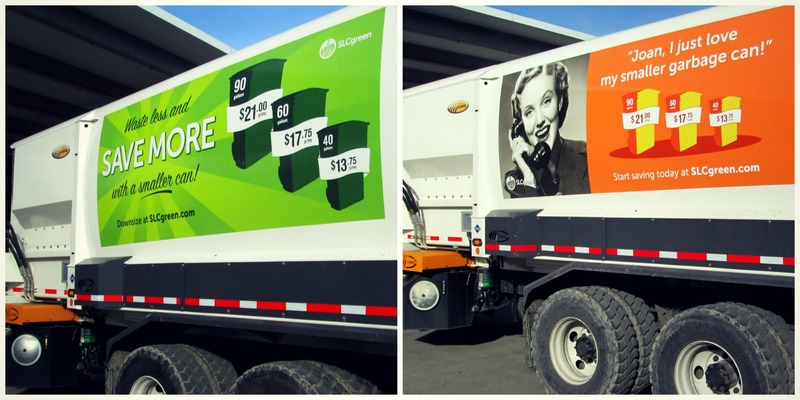 Have you noticed the new truck wraps driving around Salt Lake City? We’ve outfitted all of our Sanitation vehicles with bright new wrappers promoting downsizing options available to all city residents. So keep your eyes open on garbage day! Every month, you pay one fee for your garbage can – that’s it. Your recycling and compost can service is included in that fee. There are three garbage can sizes, and if you downsize your can you also downsize your monthly waste fee! Call (801) 535-6999 to downsize your garbage can today.